When you’re ready to focus on competitive lifting, powerlifting might be for you. It doesn’t matter if you have a competition in mind…training for powerlifting is a great way to get you looking good and feeling great. The multi-joint exercises that promote the most growth are the core focus to the progress you want to achieve. In case you’re new to the idea of powerlifting, it consists of three separate portions. Squat – Bar behind the head, across the shoulders, squat, and return to standing. At first you might think it’s all about the thighs and legs, but it ends up using muscles throughout your body, all the way to your fingers. We’ll give you the training to make sure you’re doing a safe, effective squat. And when you do it right, you can lift more. It activates muscles you never knew you had and gets the hormone levels ignited for maximum growth. Bench Press – Lay down on the bench and press up. Simple, right? Well anyone can do a bench press with just a little weight. We help get your body where you want it so that you can lift more than you ever thought possible. Deadlift – The deadlift involves lifting a barbell from the ground and raising it to your upper thighs so that you’re in a standing position, then returning it to the ground. Do it wrong and you can destroy your back. Do it right and you can be a champion. We’ll make sure you do it right. Our facility is stocked with everything you’ll need to practice for competition, both modern and traditional. Want to flip tractor tires? How about building muscles with atlas stones, kettlebells, even something as simple as a sledgehammer. We’ve got it and the instruction you need. With powerlifting, we have three goals: get you healthier, get you stronger, and keep you safe. If we do this, we end up with a happy and healthy client. Ready to get better and lift more? 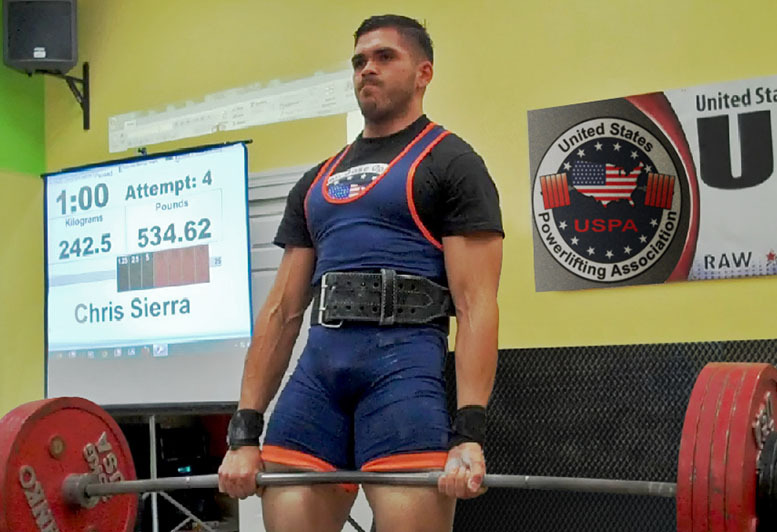 Contact Sierra Strength today!